Got a flexible schedule? Head to Bridgeport and catch Cirque's new show "Alegria." Some days, it's difficult for many of us to even touch our toes, but Cirque du Soleil performers can move in ways we never dreamed of, any time, any day of the week. Starting Thursday, you can catch the flexible phenoms, Cirque du Soleil, performing the group's latest arena show, “Alegria,” which is a Spanish word meaning happiness and it's sure to bring a smile to your face. The cast features 55 performers and musicians from 17 countries. 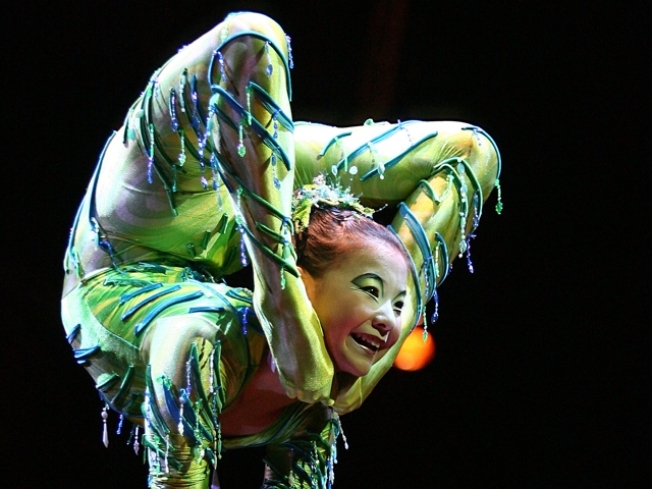 You can bet you’ll see Cirque’s acrobats wearing beautiful costumes. The show plays at the Arena at Harbor Yard in Bridgeport today through Sunday. Performances are Thursday at 7:30 p.m., Friday and Saturday at 3:30 p.m. and 7:30 p.m and Sunday at 1 p.m. and 5 p.m.
Tickets are $45 to $95 but do not include service charges. Cirque du Soleil's only other visit to Bridgeport took place in February 2006, when it presented three performances of "Delirium," its first ever large-scale arena production.